The Chiefs stayed relentless in the second quarter, using an 11-play, 86-yard drive to take a 21-14 lead on a 2-yard run by Knile Davis, who wasn't touched. SAN DIEGO The Kansas City Chiefs had nothing to play for and rested 20 of 22 starters. They still almost beat San Diego with its season on the line. Already assured of the AFC’s No. 5 seed, the Chiefs lost 27-24 in overtime Sunday to the division rival Chargers, who claimed the conference’s final postseason berth. After the Chiefs blew a 10-point fourth-quarter lead. Kansas City kicker Ryan Succop was wide right on a potential game-winning, 41-yard field goal try with 4 seconds left in regulation. "I was proud of the guys for the way they battled," Chiefs coach Andy Reid said. "Our guys came out and gave everything they could to take it into overtime and have a chance to win it. We would’ve liked to have come out on the positive side there, but we came out on the short end. Now there will be three AFC West teams in the playoffs, so that’s positive." Nick Novak kicked a 36-yard field goal with 5:30 left in overtime. The Chargers then held the Chiefs on downs to win it after they reached the San Diego 41. Earlier in the day, the Chargers (9-7) got the help they needed when Miami and Baltimore both lost. San Diego has won four straight and five of six heading into a wild-card game next Sunday at AFC North champion Cincinnati. "I look at the positive of it," Reid said of resting so many starters, including Pro Bowl running back Jamaal Charles and quarterback Alex Smith. "We got a lot of guys in to get practice with the game plan if we do meet up with San Diego again. And the guys came out and played, I think that’s the positive part of it. You get to see, from a depth perspective, that you’ve got some guys who can play and want to compete." With the Chargers on the verge of an embarrassing collapse against Kansas City’s backups, Philip Rivers threw a 6-yard touchdown pass to Eddie Royal early in the fourth quarter and Novak kicked a 22-yard field goal to tie it with 3:21 left in regulation. After Succop missed at the end of the fourth quarter, the Chiefs lost the overtime coin toss and the Chargers, who stunned their AFC West rivals 41-38 in Kansas City on Nov. 24, elected to receive. The winning drive was kept alive by a 2-yard gain by Pro Bowl safety Eric Weddle on a fake punt on fourth-and-2 from the Chargers 28. With backup Chase Daniel starting in place of Smith, the Chiefs took their biggest lead, 24-14, on Succop’s 46-yard field goal with 7:27 left in the third quarter. The drive was set up by Dexter McCluster’s 32-yard punt return to the Chargers 35. Rivers then rallied San Diego to 10 points on consecutive drives. The Chiefs took the game’s opening kickoff and needed only five plays before Knile Davis scored on a 17-yard run. The Chargers came right back on a five-play drive of their own and scored on Rivers’ 22-yard pass to Ladarius Green. The drive included a 44-yard run by Ryan Mathews, who stiff-armed a Chiefs defender for a few extra yards. After being forced to punt, the Chiefs got the ball right back when Ron Parker intercepted Rivers at the Chargers 23. Rivers yelled at rookie wide receiver Keenan Allen as they walked to the sideline. The drive was kept alive on an encroachment penalty against rookie linebacker Manti Te’o on third-and-goal from the 4, and Daniel threw a 2-yard TD pass to Dexter McCluster for a 14-7 lead. San Diego tied it with an easy 4-yard scoring toss from Rivers to tight end Antonio Gates on the first play of the second quarter. The Chiefs wouldn’t go away, using an 11-play, 86-yard drive to take a 21-14 lead on a 2-yard run by Davis, who wasn’t touched. Daniel kept the drive going on a 29-yard scramble up the middle on third-and-5 from the Kansas City 19 and a 9-yard scramble for a first down at the Chargers 42. 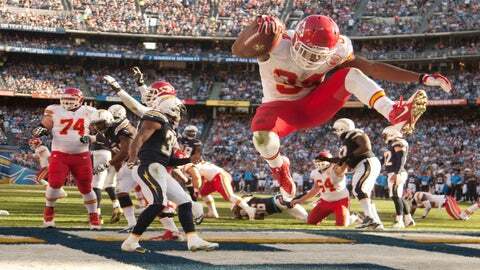 McCluster had a 12-yard reception and hurdled safety Jahleel Addae. "It was weird, pretty foreign to me. I was wandering around definitely feeling out of place," Smith said of watching from the sideline. "It’s just different. Most importantly, the team comes first and you want to support your guys. Chase and all these guys work so hard to stay prepared and stay ready. It’s your job as a teammate to be there and be supportive."